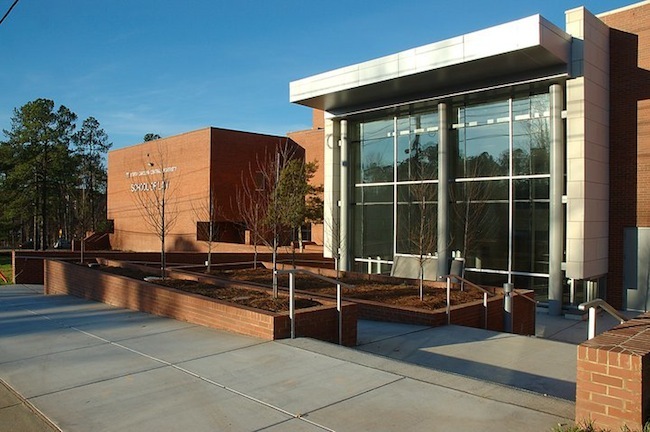 North Carolina Central University (NCCU) School of Law offers two programs leading to the Juris Doctor degree: a full-time day program and a part-time evening program. Full-time professors, clinical instructors, including 28 women and 28 minorities, work with a number of distinguished adjunct and visiting professors to teach approximately 576 students in both programs. Students who have attended the Law School range in age from 20 to 65 and have diverse education, socioeconomic backgrounds and professional experiences. As a historically African-American institution, we continually seek to enhance our focus on civil rights and to strengthen our ties to the community. The Charles Hamilton Houston Endowed Chair was established by Frank Anderson and Susan Powell to bring a prominent civil rights law professor to the School of Law to lecture in the areas of constitutional and civil rights law. The Chair has been held by such attorneys as Judge Charles Becton, Fred Gray, Julius Chambers, Alvin Chambliss, Jr. and Janelle Byrd-Chichester. In 2007, the Law School launched a Civil Rights and Constitutional Law Concentration for students interested in developing a deeper understanding of civil rights law and history. “I rave about my law school,” gloats a 3L at the North Carolina Central University School of Law. By all accounts, NCCU is a “great value.” It’s unquestionably possible to graduate from here with little or no debt. The renovated law school building feels “very new” and it’s “always well-kept.” The facilities are state-of-the-art” and “extremely high-tech.” “Practical training is strongly encouraged” and readily available. “NCCU has substantial opportunities for practical legal experience outside the classroom,” explains a 1L. “Excellent” clinics, pro bono opportunities, externship programs, and hands-on skills courses provide real world experience galore. “The variety of clinics” (eighteen in all) includes criminal litigation, juvenile law, and a small business clinic—just to name a few. There’s also a standard JD/MBA program, a JD/MLS program (for future law librarians), and a unique Biotechnology and Pharmaceutical Law Institute, where you can engross yourself in the labyrinth of prescription drug regulation. It’s also worth not­ing that students here have easy access to the state and federal courts in the nearby state capital, Raleigh.Inside the classroom, the “passionate, knowledgeable,” and “very dedicated” faculty brings plenty of “real-world” know-how. For the most part, professors are also “very clear in explaining concepts.” “The teachers are really encouraging, and they want to see each student succeed.” “Motivation, guidance, and encouragement” are ample. “Faculty accessibility” is another huge plus. “They are tough but there for you in many ways.” Faculty members are “very responsive” and “always available and willing to help” if you stay after class or stop by their offices. Some students call NCCU “the total package” and wouldn’t change a thing. Others, however, see areas that could be better. While some students tell us that management is “organized” and “always helpful,” for example, others disagree. Also, despite the fact that a loyal alumni base works “to ensure that you have an opportunity to practice” and a recently reorganized Career Services Office has helped students with job placement, “other support services” could still use “an overhaul.” A broader selection of electives would be another improvement. “We could offer a wider variety of classes in more con­centrated areas,” suggests a 3L. G. K. Butterfield - U.S. House of Rep.
Want more info about North Carolina Central University School of Law? Get free advice from education experts and Noodle community members.